The holy month of Ramadan is a sacred month for Muslims around the world as we observe fast from dawn till sunset. Sharing some fun ideas and resources to make it a memorable ramadan for kids. (Special note: Don’t worry these ideas don’t need a lot of prep and you can get these going right away or later in the month). Discuss with your children the spirit of the month of Ramadan and the benefits we can get out of it. Fasting in the long days of summer requires discipline, patience and resilience from adults. Once children realize the virtues of the month, they also want to participate as best as they can and support their parents. Children are fascinated with the concept that all good deeds are multiplied during the month of Ramadan. Encourage them to do one good deed a day. You can make a jar out of which the children pick one good deed for 30 days. Ayesha from ‘A Crazy Ammie Blog’ has a lovely list on her blog. 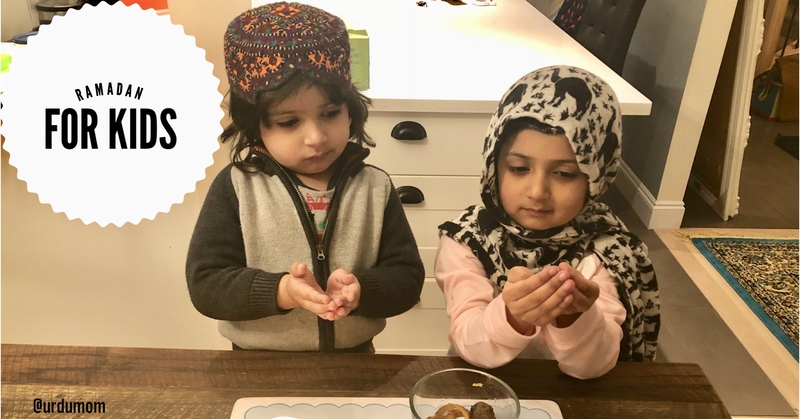 One of the most effective ways to make it a memorable Ramadan for kids is to spread the joy of the month and make your children proud of their Muslim identity. Ask the school teacher if you can come in and read a story about Ramadan and Eid. My Eid Mubarak Storybook is one of our favorite. Another idea to spread the joy in Ramadan for kids is to encourage them to set up a lemonade stand outside the house and give out cold drinks for free in the spirit of the month. They can put up a Ramadan Mubarak sign and tell neighbors about the month and why Muslims celebrate it. Ramadan is a great opportunity to learn more about Islam for the whole family. Encourage children to learn ayats and especially their meanings. Read books about the lives of Prophets and discuss the lessons in them. And if you need a little time out, Ali Huda (The Netflix for Muslim Kids), is a great idea to have some strategic screen time where the kids learn and mom can catch some rest. You’re welcome! I have collaborated with three other amazing bloggers to share more ideas to make this is a memorable ramadan for kids. Yusra has the loveliest ideas for Ramadan this year with her one year old. This is a great post for moms of little ones! Sumaira has great ideas for making it a memorable ramadan for kids. Being a mom of four, she is definitely a pro! Ramadhan is the ninth month of the Islamic calendar, and the month in which the Quran was revealed to the Islamic prophet Muhammad. Fasting during the month of Ramadan is one of the Five Pillars of Islam. Some useful ideas for the kids growing up to make them understand the importance and spirit of Ramadan. Thanks for writing about it. We should learn kids about islam, gift them islamic story book, learning them iftar making and much more.